We have what is called a "dirty ridge" that has formed in the East Pacific ocean, pushing the jet stream north of us, but offshore. This particular pattern has the jet stream moving from the northwest to southeast just north of our area. It has created multiple convergence zone bands of rain the past few days, which has already brought our rainfall for this month to a total of 1.47 inches. 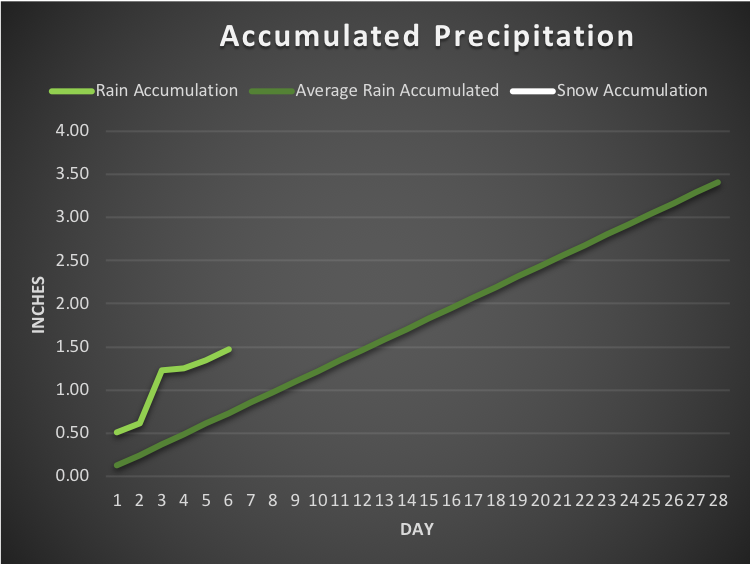 The normal rainfall amount for February is 3.41 inches. The pattern is expected to continue for the next 7-10 days with the ridge shifting east and getting a little stronger this weekend. Thursday - Friday will be showery and cloudy, with some windy conditions Thursday afternoon. Friday night, as the ridge shifts to the east, we should clear up to give us a mostly sunny Saturday. Sunday the ridge will back off a little to let clouds return with more showers through next Wednesday. Highs are expected in the lower 50's and lows in the 40's. Saturday - Tuesday lows might dip into the 30's with frost possible in places Saturday and Sunday morning. Highs will range in the mid-upper 40's for the cooler stretch before returning to the 50's mid next week. 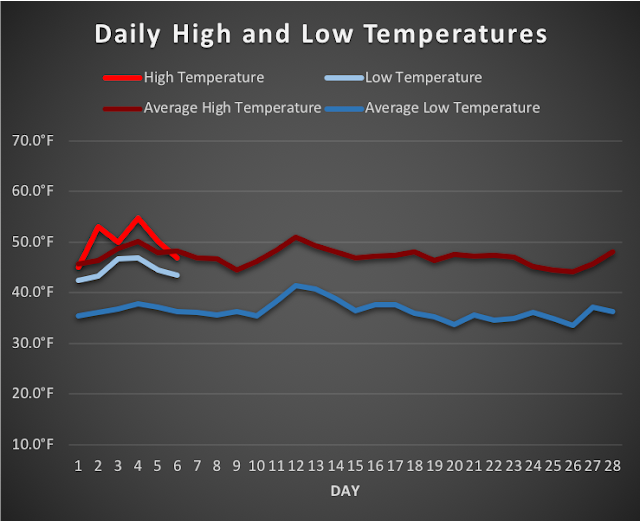 We are running a bit above average for temperature so far this month but I expect this to drop down to normal in the next few days. 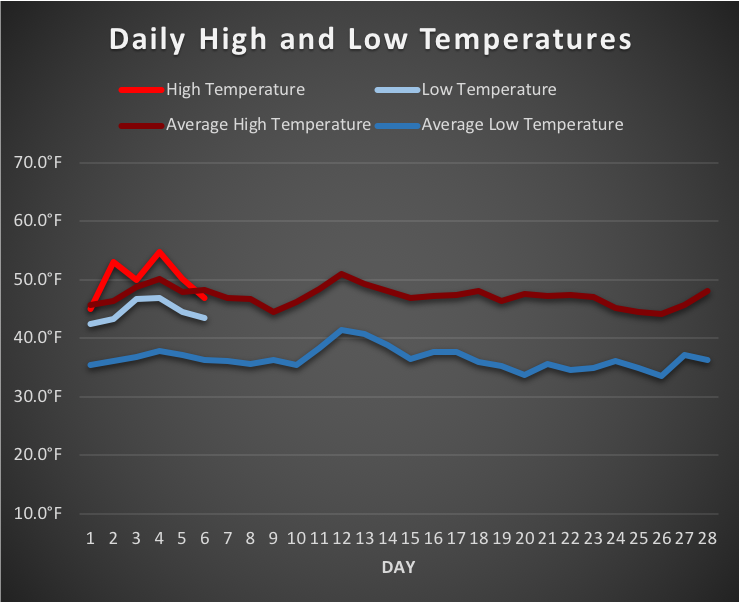 We are particularly warm for low temperatures right now as shown by the graph. Daily Temperatures for February 2018. We are having a La Niña winter pattern in the tropical Pacific; however, not all La Niña's are alike. This one has generated a much wetter than normal winter, but temperatures have been close to normal or above normal, instead of the typical below normal temperatures we usually get with a La Niña. January's total rainfall was nearly double the average rainfall for that month. Long range forecasts still hold a cooler and wetter than normal pattern for February, March and April. I am expecting the active wet weather to continue. It was practically balmy last night after our dog walk so we sat outside for ~an hour from 8-9pm.